.....It has been pointed out by the F.A.A. 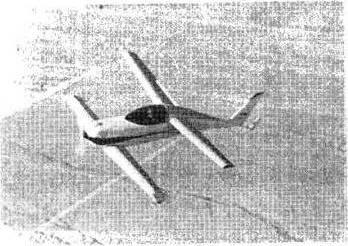 Eastern Region E.M.D.O that the canopies of the bubble type found on Vari-Eze, Quickie, KR-2, etc., are impossible to break or open with the bear hands in an emergency and not all emergency personnel know to freeze the lucite canopywith CO2 before it will break. Therefore, an emergency canopy opening system is desirable. 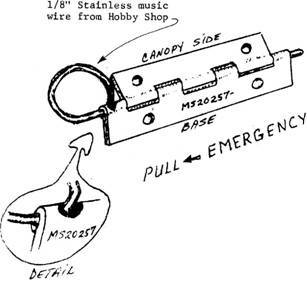 .....An acceptable answer was found when using MS20257 type hinge, the hinge pin is replaced with 1/8" stainless music wire that has a one inch finger loop at the front end. A 1/8" hole is then drilled into the base side of the hinge and the wire loop end snaps into this hold and locks the pin in place until pulled to release the canopy in an emergency. To finish the job, use 3/8" red "stick-on" letters along the hinge "PULL-EMERGENCY". Simple and safe. 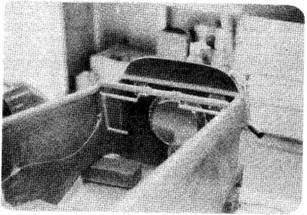 Richard Hoskins found an easy way to move the Rudder Pedals AFT by duplicating the firewall stiffener and mounting the rudder pedals from it. .....Every Saturday st 10:00 in the morning, we put on a flight demonstration with the Quickie. 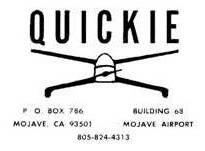 This is an opportunity for all individuals interested in the Quickie to see it perform. We have flown the Quickie during these demonstrations in winds of 30-40 knots and takeoff density altitudes of over 6,000 ft.
.....Total time on N77Q to date is over 270 hours.